PERLAS Pilipinas team manager Cynthia Tiu is seeking answers from the Samahang Basketbol ng Pilipinas (SBP) on why the erstwhile national women’s basketball team was suddenly dropped without an explanation - and replaced by a squad being formed by new backer Ever Bilena. Tiu, owner of Discovery Suites that bankrolled the Philippine women’s basketball team’s campaign for the past seven years, said people behind Perlas Pilipinas from the players to the coaches were left in the dark about the SBP’s decision to put up another another national team. Ever Bilena, owned by Dioceldo Sy, has been recently named as the new patron of the women’s team, with Patrick Aquino assuming the head-coaching job from Haydee Ong. Tiu said the team already sent a letter to the SBP seeking an explanation about the sudden change in the national women's basketball program with the Southeast Asian Basketball Association (Seaba) championships and the Southeast Asian Games just months away. Tiu said she also doesn’t understand why the SBP is breaking up the Perlas Pilipinas team which has been preparing for the two international competitions since last year. “Why immediate? Why the urgency? It doesn’t make sense that we had to fight to play in the SEA Games (in 2013) and they are sending a team with an entirely new coach, months before the SEA Games,” said Tiu in a lengthy interview with Spin.ph. Tiu spoke to react to an earlier report by Spin.ph that Perlas Pilipinas players were a no-show in the first set of tryouts called by the new management attended by 40 aspirants. Tiu, whose company started supporting the women's basketball team in 2007, claimed she had an agreement with the SBP though executive director Sonny Barrios last summer that they will handle the national program until June 2015 or after the SEA Games in Singapore. But rumors began circulating last year about possible changes in the program, prompting Tiu to ask the SBP for a dialogue on what the real score is. No response was given by the SBP, according to Tiu. “Next thing I knew, I got a letter dated January 21 that this is what the (SBP) board decided and starting February 1, there will be a new coach, the current team will slide to the training pool, and saying thank you for the support all these years,” Tiu said. She said the Perlas Pilipinas program won the country's first-ever gold medal in the Seaba championships in 2010, and took home silver medals from the 2011 and 2013 SEA Games. “I would like to at least have a chance to discuss what could have possibly gone wrong with a seven-year program. But they never got back to me,” said Tiu. Tiu believed politics was behind the decision, hinting it has something to do with a “gentleman’s agreement” between Ever Bilena and the SBP. Tiu didn’t go into specifics, although the link between the group of SBP president Manny V. Pangilinan and the PBA team of Blackwater and Ever Bilena owner Sy has previously come under scrutiny from both the media and the fans. Sy, incidentally, is also the top backer of the National University Lady Bulldogs team that took home the UAAP women's basketball championship this season. “It’s sad to know na kahit nakatago na kami sa kanto para hindi kami mapansin ng pulitiko, hinahanap kami. ‘Yung mga veterans, talagang they are bothered kasi pinaghirapan namin ‘yan. It doesn’t make sense that if it ain’t broke, why fix it," Tiu said. “I need SBP to answer me convincingly and objectively how they can just swipe out the medalist as soon as possible and they can’t wait for three more months. This team is ready and has been preparing since last year. I know MVP (Pangilinan) and I know that he has absolutely no idea what is going on." Tiu added, “There was a gentleman’s agreement. That is very loud and clear. I told (Sonny) Barrios that I know there is a gentleman’s agreement. I don’t want to name names. This person and this person and they just threw us like that,” said Tiu. Tiu said it was the players’ decision not to show up for the tryouts set by Aquino. “What’s happening is that they are trying to get the Perlas girls to try out which they don’t want. In my mind, I was thinking that with the way they didn’t process this change, they think that the girls will just slide over? “Nobody is stopping them from going to the tryouts. If there’s anything that drives our girls to play, it’s definitely more than the passion for the game. I told them na if they go to the tryouts, go for the right reasons, and they say they are not going,” Tiu said. The Perlas team manager said she owes it to the hardworking players and coaches who were in the program to get an answer from the SBP, which she claimed had given the team little support. “I’m not hanging on because I want to be the manager for the rest of my life. But this came from the players and coaches because they built this program,” said Tiu. “They exist because of the allowance from the PSC (Philippine Sports Commission) and maybe a little that I put in. It’s a personal thing. Kaya I told the players that what makes me proud of them is they play not because of money. “Kaya I find it very rude na parang pinamimigay lang kami. 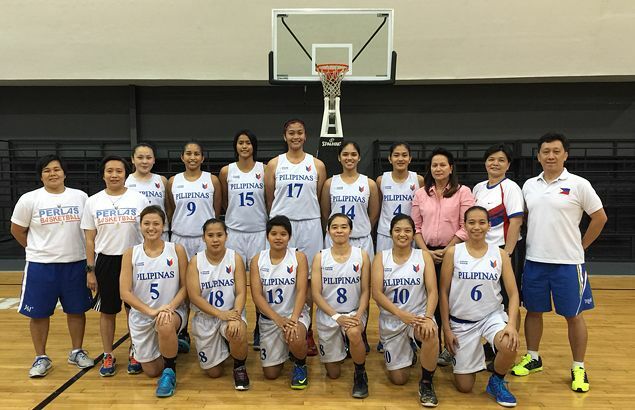 Dati, nobody wanted to have anything to do with the (national) women’s team. Gilas lang. But now ...” said Tiu, without elaborating. Tiu said she still hopes the SBP will have a change of heart as the team continues to practice at the Rizal Memorial Sports Complex. “I’ve sent an email. But, nothing is moving,” said Tiu.